This little quartet-setting of Schumann’s own words (four solo voices and piano) gives us a glimpse into a touching moment, one of the last, in the composer’s domestic life in Düsseldorf: the consecration of a piano that Schumann had bought his wife as a present for her thirty-fourth birthday, 13 September 1853; the couple’s thirteenth wedding anniversary had been celebrated the day before. The new piano was manufactured by the firm of Klems in Düsseldorf. It was clearly an occasion for which the composer had carefully planned, quite apart from the cost of such a handsome present. The poem had already been written as far in advance as 5 July. Gentle arpeggios in the key of E major (the marking is In ruhigem Tempo) ripple beneath writing for SATB quartet that is demanding enough to have required a certain amount of secret rehearsal time—who exactly the performers were we do not know. The style is that of the later songs and chamber music without displaying the musical sense of purpose of the earlier years. On this festive occasion Clara received as gifts manuscripts of the Overture for the Szenen aus Faust, the Fantasie for violin and orchestra Op 131, and the Concert Allegro for piano and orchestra Op 134—all these works had been deliberately hidden from her until they could be presented to her as part of her birthday celebration. The extent of Schumann’s devotion to his wife, and his conviction that his more recent works were only possible because of her inspiration, are evident in a letter the composer wrote at the time to the violinist Joseph Joachim. This was to be the last of Clara’s birthdays celebrated by the Schumann clan as a united family. A year later, in September 1854, tragedy had already struck, and life had changed irrevocably: on Clara’s thirty-fifth birthday the composer was given permission by the medical staff at the asylum of Endenich to write her a letter. The strange little poem gives some clue regarding Schumann’s strangely prophetic misgivings about his future. Even if he can’t be there personally, he hopes that the piano will serve to remind Clara of the giver of the gift. She was probably as disquieted by the poem as she was delighted by the piano. It was indeed to come in useful. 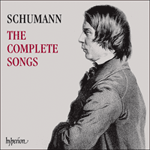 With Schumann in the asylum she had no choice but to re-establish her career as a virtuoso. Every time she practised she must have remembered the little scene where the piano, surrounded by a garland of flowers, was handed over to her while this music, so lovingly meant, so awkward in its mild reticence, rang in her ears. Préparé pour le 13 septembre avec son cadeau d’anniversaire (un nouveau piano), c’est une salutation familiale, un peu élaborée, pour Clara à l’occasion du dernier anniversaire qu’elle célébrera avec Robert; elle a trente-quatre ans. Zu Claras vierunddreißigstem und letzten zusammen mit Robert gefeierten Geburtstag schenkt Robert ihr ein neues Klavier. Das muß wohl von meinem Liebsten sein. Die Kunst sie bleib Dir werth! Eil’ dann zum Freund u. denke mein! All Leid und Freud zusammentragen. That must be a gift from my love. May art remain worthy of you! Hasten then to your friend and think of me! Bear all joy and suffering together.